Tathagata Roy’s views are the real views of the Sangh Parivar. Innocent of any moral, political or even nationalistic responsibility, Meghalaya governor and former president of BJP’s West Bengal unit, Tathagata Roy, has let the cat out of the bag. In a tweet yesterday, he made the shocking statement that he agreed with an unnamed army officer’s view that “Don’t visit Kashmir, don’t go to Amarnath for the next 2 years. Don’t buy articles from Kashmir emporia or Kashmiri tradesman who come every winter. Boycott everything Kashmiri”. This has been panned extensively in social media, and condemned by most political parties, except the BJP. But what he says has been playing out in reality in many parts of the country. Led by RSS affiliates like the VHP and Bajrang Dal, groups of people have attacked Kashmiri students or traders in places as far apart as Patna, Jaipur, Dehradun, Ambala and even Delhi. This was supposedly a reaction to the February 14 attack by a JeM fedayeen on a CRPF convoy going from Jammu to Srinagar. The attack which shocked the country, killed at least 40 CRPF personnel and injured many others. Is Roy some kind of uncontrollable fringe element? Some would have us believe that. But if you look at the RSS thinking on Kashmir, and on the enormous damage inflicted on the state by the Modi government since 2014, Roy’s fulminations look more like the real thing, the core ideas of the Hindutva brigade led by the RSS. At present, with an important, watershed general elections coming up in a few weeks, the sole objective of the BJP/RSS is winning it. Among the various tactics they have adopted to fight out this tough election is the vilification of Kashmiris, blaming them for the bloodshed in the state. This serves the important purpose of hiding their own abject failure in Kashmir, and also of polarising the people of the country on ultra-nationalistic lines, which in RSS thinking, coincides with religious lines. In other words, Kashmir is being sacrificed to win an election. Right from the time when Bhartiya Jan Sangh leader Shyama Prasad Mookherjee (who was president of the Hindu Maha Sabha and founded the Jan Sangh in 1951) led a satyagraha in Jammu purportedly against the Article 370, but actually against the land reforms of the Sheikh Abdullah government, the Hindu right wing has believed that while the land of Kashmir belongs to India, its Muslim residents should leave their homeland, perhaps to go over to Pakistan. That is why, the BJP has always stood for abrogation of Article 370, which was included in the Indian Constitution in order to assure the Kashmiri people that their rights and autonomy will be protected when their ruler Raja Hari Singh agreed to join the Indian Union in 1948 by signing an Accession Treaty. Ironically, the Kashmiri people, who are being blamed for supporting separatism, observed strikes and protests against attempts to abrogate Article 370 last year through court cases – an act of defending the Indian Constitution! At the root of this hostility is the RSS view that India is a country that is meant only for Hindus, as the RSS ideologue M S Golwalkar had repeatedly stressed on in his writings. This idea finds Kashmir most difficult to accept. But it has never found much acceptance in India generally, and of course not in Kashmir. Modi led the BJP to power in May 2014. In December of that year, the J&K Assembly elections were held, and a hung House emerged. Despite their opposing ideologies, BJP and PDP led by Mufti Sayeed formed an opportunistic coalition government. In 2016, Mufti Sayeed died, and his daughter Mehbooba Mufti took over as an uneasy chief minister with the BJP support. This inaugurated a period of extreme political brinkmanship in the state with the BJP pushing its Hindutva-oriented politics in the Jammu region, and a no holds barred military-based, act-tough policy for the state as a whole ostensibly to put down the simmering insurgency that had been going on since 1989. 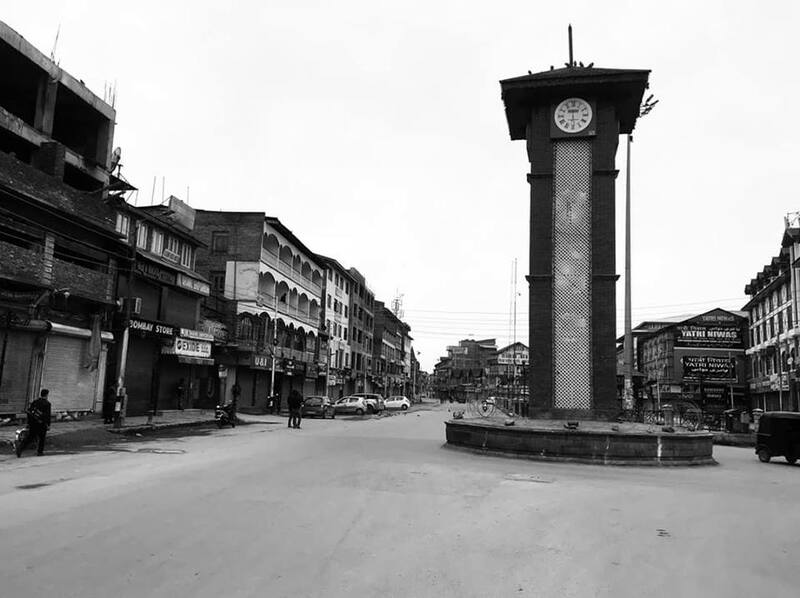 This insurgency, mostly backed by the Islamic fundamentalists including from across the border, had exploited the alienation of the people and economic backwardness to draw local support. The opportunistic alliance coming to power, and the Hindutva push by the BJP further aggravated it. 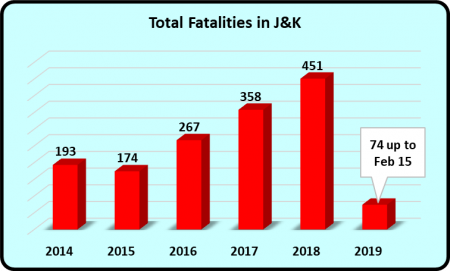 Fatalities of civilians, security forces and terrorists zoomed up in the hapless state (see chart below), after declining steadily for several years since the mid-2000s. The security presence mounted, and each new measure encountered new resistance – pellet guns on stone-pelting demonstrators, brutal cordon and search operations, civilian killings – all escalated the divide between the people and the state. On the Jammu side, BJP and its affiliates continued with their polarising agenda, shockingly manifested in supporting a group of people who had raped and killed an eight-year-old Muslim girl of the nomadic Bakarwal community in Kathua, Jammu. There was no real progress in terms of a political solution as the BJP put into practice its so called hard line. This only pushed the state into further alienation, anger and resistance. Ultimately, the PDP was unable to bear the strain, and Mehbooba resigned in June 2018, after which the state came under the direct rule of BJP through the Governor Satyapal Malik, a former BJP leader. He continued the same policies with gusto and the alienation of people further aggravated. Kashmir was turned into a disaster zone by the Modi government. What happened in these five years is that the BJP not only failed spectacularly in controlling the separatist flames, but it actually fanned them, all the while vilifying the Kashmiri people in the rest of the country. It continued to sell the false idea to the rest of the country that it was dealing effectively with an anti-national insurgency in the state, hoping that this would consolidate its image of a muscular government willing to take the bull by the horns. It is these seeds that have now ripened and the bitter harvest is ready. For the BJP to dream that Kashmir would remain joined to India even as their storm troopers go about beating up Kashmiris in the rest of the country – something like the Israeli approach to Palestine – is not just living in la-la land. It is an admission of failure. It refused to even once start a real political dialogue among the various parties and groups in Kashmir, it offered no real economic policies or aid to lift the destroyed economy, and it was never willing to address any grievances of the people. But in the process, Kashmir has become bloodied, and wounded. Perhaps only a fresh new approach from a fresh new government will start the healing process again. This will be decided in the upcoming general elections.